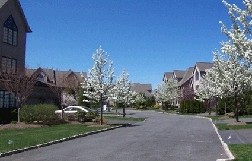 Park Ridge is one of eight towns in the beautiful Pascack Valley section of Bergen County. It is known for it's excellent schools and wonderful accessibility to New York City. In the early 1900's, it established its own Electric and Water Companies that still service its residents today. Park Ridge is home to a growing corporate population while it still maintains its small town flavor. The historic "Bears Nest" area is being developed with luxurious townhouses, a major hotel and well designed corporate campuses. Richard Nixon was once an owner of one of the original Bear's Nest townhomes. Numerous recreational activities are available at the municipal pool, tennis courts and athletic fields. *All of the information contained in this blog is taken from SusanLaskinRealtor.com. All of the information is copyrighted.